If you see an error stating, "Sorry, there was a problem with your last request," you have received a friendly error page. 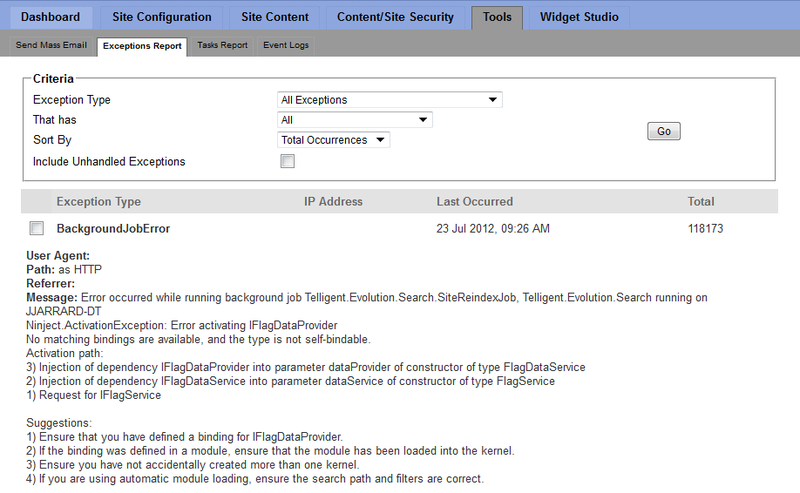 This means that an error has occurred in Telligent Community Server that you want to investigate and resolve. The friendly error page is nice for users because they don't get bombarded by intimidating technical error messages; however, it does make work a little tougher for administrators who need to find out which actual error occurred so they can resolve the issue. After you see the real error that is occurring, you may have enough information to resolve the issue yourself. If the error message doesn't help you resolve the issue, you can work to resolve your issue by searching the forums or submitting a support ticket. If you have direct access to the server on which Community Server is hosted, and can sign into it yourself via remote desktop, then you can sign into the server and visit your site directly from an Internet browser on the server. When an error does occur, you should get an ASP.Net exception error such as the one below which will tell you the real error that is occurring. Now that you have found the real error that is occurring, you can work to resolve your issue by searching the forums or submitting a support ticket. Most errors causing this message are logged in the Exceptions log within the Community Server Control Panel. To retrieve the error, open the exception report tool. Use the criteria options to attempt to locate the error that occurred at the time that you encountered the message above. If the error occurred recently, change the Sort By field to Last Occurred and check the Include Unhandled Exception check box, then click Go. The latest error will be shown first. Now that you have found the real error, you can resolve your issue. You can also clear the Exceptions log; reproduce the error, and view the exceptions that were logged via the Exceptions report. You can clear the Exceptions log by searching for exceptions and clicking Delete All. Note: Care should be taken when disabling custom errors because users might get intimidated by the error page in the event they get an error. If you are developing/ on top of Community Server, it may be appropriate to disable custom errors while you are developing, and then re-enable them after you deploy Community Server to a live site. Open the Web\web.config file in the root of your site. mode="RemoteOnly" to mode="Off"  Note: be sure to match the text case shown here ("off" is not equivalent to "Off"). When an error next occurs, you should see an ASP.NET exception message with details about the error that occurred. This is the same error page you see if you access the server directly from the server on which Community Server is running.